“We expect annual rates of GDP growth to average 7.0 per cent between 2018 and 2033. This will see the country climb 19 places in the World Economic League Table to become the world’s 24th largest economy by 2033,” the CEBR said. The World Economic League Table forecasts the size of economies of 193 countries in the world. Among the Bangladesh’s competitors, Vietnam is expected to be placed at the 30th position, Taiwan at 19th and Sri Lanka at 63rd in 2033, the CEBR said. 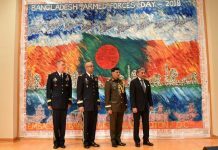 According to the research firm, the size of the Bangladesh’s economy (Gross Domestic Product) will reach US$1.05 trillion at current prices in 2033 from the last year’s size of $286 billion. The country has benefitted from a strong increase in remittances in the financial year ending 2018, after seeing declines in the previous two years, it said. Indian clothing retailers, as well as global retailers opening Indian outlets, increasingly import from Bangladesh due to the competitive prices of their products, it added. Bangladesh’s competitiveness relative to India was further boosted by the introduction of a General Sales Tax (GST) in India, a step that is still outstanding in Bangladesh, the UK-based firm pointed out. Growth in Bangladesh’s economy is driven by domestic consumption expenditure, government spending, remittances and exports, it said, adding that while the country has made important steps towards modernising its economy in recent years, significant challenges remain. The CEBR suggested that the Bangladesh government would also need to explore options on how to increase revenues in order to finance upgrades for infrastructure while maintaining the social safety net. The country is further grappling with the Rohingya refugee crisis, it added. The CEBR also predicts that the Asian nations will dominate the global economy by 2033 as three of the top five global economies will be from this continent. China will be the biggest economy in 2033, while India will be 3rd and Japan 4th. The US will be the 2nd and Germany the 5th in terms of its economic size in 2033, it said.